Homemade fettuccine pasta from scratch is worth the effort and makes any meal outstanding. Make these noodles and serve with my homemade alfredo sauce; it's heaven on a fork. Divide dough into 2 or 3 parts and roll out into rectangles as thin as you can make them. You should be able to see through the dough. Fold or roll the dough loosely from the short side down the length of the sheet. 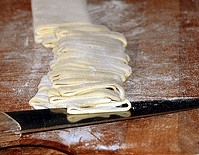 Use a sharp knife and cut the dough into 1/4 inch strips (or narrower); shake strips loose. Cook in boiling salted water until al dente. Drain and serve with your favorite sauce. PREHEAT oven to 375 degrees and spray a shallow baking dish with oil. Put the fettuccine on to cook in salted water. While the pasta is cooking, melt butter in a skillet and add the mushrooms, salt, pepper, oregano and garlic powder. Saute on low for 5 minutes. When the fettuccine is al dente, drain and place it in the prepared baking dish. Toss with the Romano cheese and then stir in the butter and mushroom mixture. Sprinkle with mozzarella cheese and bake for 5 minutes, or until the cheese is melted but not browned. You will agree that this Fettuccine Alfredo Recipe is a keeper. I love to serve this with a simple fresh salad drizzled with my homemade Italian salad dressing. In a bowl, combine the butter, garlic and parmesan cheese. Season with the remaining ingredients and mix until smooth. Spread on the bread and broil or bake until golden brown. This garlic butter also goes with so many things it would be impossible to list them all. I make up triple batches, making them into logs and freezing them. That way the butter is always on hand at a moments notice to put on fish, slip under the skin of chicken, or melt over a New York strip steak.